No shots were fired. This thug was running for his life after a liquor store clerk in Sunderland, Ma. pulled out a firearm in self-defense after the robber came in and displayed a large knife and demanded cash. You won’t see this in the statistics because no shots were fired and nobody was injured. Remember these events happen every single day, multiple times per day. 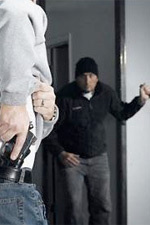 Sometimes, the presence of a firearm stops a robbery or assault without the victim even knowing what could have happened. From WWLP. Sunderland Police Chief Jeffrey Gilbert told 22 News that a man wearing a white knit cap with holes cut out for his eyes, walked into the Spirit Shoppe on Amherst Road, and pulled out a large knife. At that point the clerk displayed his own weapon, a handgun of unspecified caliber, and the unsuccessful robber ran out of the store empty handed. Update: What I mean about “not in the statistics.” The government and private organizations collect all sorts of data on the use of firearms during a crime, but the data is driven by injuries, deaths, and the criminal using the gun. There is no data set from the FBI crime statistics telling us how many times a gun is used for self-defense. Like mentioned above, activities like open carry could stop a crime before anyone – except the criminal – knows it’s about to happen. We also know concealed carry – when the criminal knows it’s possible the target may have a gun – can stop a crime too. Even better is that everyone knows that I carry a gun & it ain’t for fun.The bad ones shy away,they can tell my smile is backed by something. Excellent point! Actually, computers could capture this easily, if ?the incidences were coded in police records. However, facts aren’t important only emotion is. Kudos to the clerk. He very well saved himself some stitches or worse. The lefties won’t give this any play. Why? It proves the 2nd Amendment’s point. Lefties hate that. The left only wants to coo about the poor robber being a victim, yada, yada, yada. Here is a case where victim-hood was thwarted all around. Way to go, Gun Guy.